Aw no, hope that's not too serious Dom. Let us know what they say. No cycling for me for a while. Went to kick a ball and managed to pull/strain or even tear my right thigh. Going for an ultrasound on Monday. Plonker! On yer bike! Best cure is to ride!!!! Well, I never did find out what ToB teams stopped at the local Hotel last night. When I went to Tesco last night it was too dark to see into the car park and when I had quick ride over this morning, the last of the buses was just disappearing of Tesco roundabout. It was a red one, so possibly Katusha-Alpecin or Lotto Soudal. Anyway, I had a ride out to Bliidworth to see the sprint there. Only been to Blidworth twice and both times it's been to see a ToB sprint. It was a nice ride out, averaging over 19mph with a favourable wind. But on the couple of Strava segments that coincided with the ToB riders, they have shown me up for the slow old man that I am! Still it was nice cycling through Edwinstowe being cheered and applauded by large crowds. I don't normally interact with people, but I smiled, waved and gave my best "Thank You, Thank You" to them all. It does help spur you on. Best thing about yesterday was that I have a Strava Flyby with André Greipel! Appreciate the advice Nick but even watching some of La Vuelta during my sofa bound Saturday was painful! That finish climb in the Vuelta was painful. I'd be grinding up at walking pace yet they were racing up it. Bonkers. You're no slouch Nick. I've seen your average speeds on Strava! Mrs S mentioned that it was a rather nice late afternoon as she came home from work, and I decided that I'd do 20 or so on a bike. I took the first Boardman, since I still haven't bothered to lube either the Cannondale or the X, due to my inherent idleness. Noticed when I entered the garage that one of the mousetraps had claimed another victim - nice and quick, straight across the back of the neck. First one for months, and I'd actually only left the mousetraps out due to the same idleness. I'm surprised that a chunk of flapjack that had been in there at least six months was enough to entice a rodent to its death, but it seems they aren't fussy. I'll take it to its final resting place tomorrow. Anyway I thought I'd do a shortish Twycross. I did the version that cuts out Sheepy and goes straight down the A444. Doesn't quite feel like a 'proper' Twycross unless you at least take in Sheepy Magna, but perhaps in a couple of weeks. Since I shaved my head last night - it's something I do every year or two, I find it quite cathartic - I wore a beanie instead of a helmet, which I thought might be over-ventilated for a highly-exposed pate. Knee pain started to kick in after 15 miles or so, which is a definite improvement over a couple of weeks back. But it's really hard to get a feel for how well it's recovering. I don't honestly know if I'm doing the right thing by cycling 20+ miles. But it's good for morale, and a bit of exercise. Was surprised by how gloomy it was when I emerged from the garage. Either darkness started to descend really quickly or I hadn't noticed it creeping up while I was riding, and I should have had lights on. But the Sun was still just above the horizon two miles from home. 21.8 miles. 69 this month so far. Thanks! I'm OK on the flat, but when the gradient gets to a sustained 7+% it's engage lowest gear and grind. Noticed when I entered the garage that one of the mousetraps had claimed another victim - nice and quick, straight across the back of the neck. Bodybagged it earlier this afternoon. The trap visited sufficient force to the back of the neck that it cracked the plastic sleeve around the kill bar. It had left a neat, deep groove in the mouse's body. I reckon the corpse was no more than 4mm thick along the compressed base of the groove. I will clean it and redeploy it with a fresh bit of oat bar later. Will lube the X while I'm in there, as well. Nice enough weather today, not so nice tomorrow and my knees seem to have coped admirably with the modest achievements required of them over the last week or two, so I decided to do a "proper" Twycross, going right through to Sheepy Magna. I lubed both the X and the Cannondale on Thursday, and I took the X. Wrapped up a bit too warm but otherwise - what a lovely ride out in the late summer sunshine. I behaved and wore a helmet this time and my recently-shaved head didn't feel too cool. It's more of a "suedehead" sort of look now anyway. Really a joy to be pedalling the road between Twycross and Sheepy, listening to footy on 5 Live again. Since I took in Sheepy I thought I'd end up on 26 miles or so, a couple of miles more than the 24 miler that I did about a week ago. But nope, I did 24.10 miles. However I remember now that I extended that one a week ago spontaneously in mid-route. If I'd actually planned to do 24 I would have done the route I did today. Very happy to have done a decent version of my favourite route again. Right knee is a bit sore now, but recent experience tells me it should be fine again by Tuesday or Wednesday. 93 this month, 1846 this year. Doubtful that I'll equal even my 2015 total (2702) this year but I'm just taking them as they come. Being able to do a Fondo again will be a bigger achievement to me than any particular mile tally. 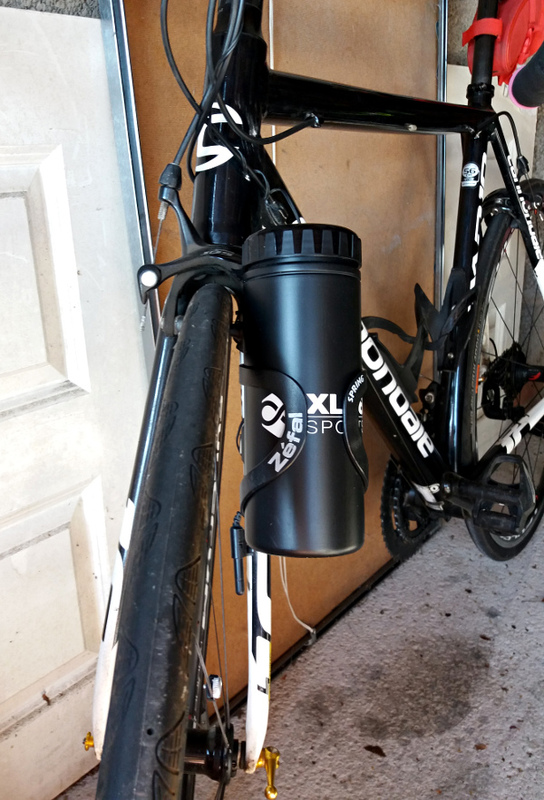 The new front fork-mounted bottle cage, with a container pod. I wonder if it might affect steering a touch in a headwind. Will give it a go some time. After a week out of the saddle, my fitness levels have taken a pounding. It was hard work today. My Giant Speed and Cadence sensor took a pounding too. I'd changed the battery in it and after I'd done about half a mile it said I'd done 2.5 miles at an average of 91 mph. Something amiss there, so back home to smash it with a hammer. That'll learn it! The Col de Wigley was hard work into a headwind, as was the climb of Abney. Wasn't helped going up Abney when my chain came off. Something else to sort. I then made my first ascent of the Bamford to Stanage climb. My Garmin always urges me to do it when I go by so I did. It only averages 3% over its 4.3 miles, but it's up and down, so whilst downhill is good it means more uphill to come. All the sheep in the road didn't help either. I had intended on doing a 100 mile sportive tomorrow with 9,000 ft of climbing, but the weather forecast put me off. Today's ride said it would have been too much for me. Slim, that front fork mounted bidon looks ridiculous. And finally, a big Sombrero - barring accidents - to Simon Yates for winning the Vuelta That's all three Grand Tours with a British winner this year. I must admit I'm not convinced. The idea is to provide more storage space on the bike for longer rides - for cheese rolls, oat bars, gels, Allen keys, spare DAB batteries and the rest - and eliminate the need to take a back pack. But I couldn't stow away a fleece in a dummy bottle so I'd probably want to take a back pack anyway. I usually take a light backpack, a dummy bottle and a bidon. Sometimes a small frame pack as well. Unfortunately the rear forks are a bit too slim for the mount, which is a bit like a sort of internal jubilee clip. It's really intended for a seat post I think. Tesco do a very basic but super cheap and super light small back pack for about £3 by the way. Ideal for cycling. I never ride further than what two bidons of water and the pockets of my jacket allow. Keeps it simple, just like me. I never take more than one bidon of liquid - I fill up at a garage or village post office or whatever at strategic intervals.